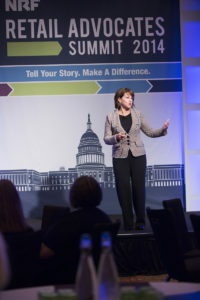 In 1999, a valuable resource became available to organizations that want to improve their PAC and grassroots effectiveness when Amy Showalter left the highly esteemed Nationwide Civic Action Program to establish The Showalter Group, Inc.
Amy sharing with members of the National Retail Federation how to successfully influence “up” by using the underdog edge. best fit. In fact, over 85% of our long term consulting clients have experienced an increase in budget, staff, and senior management recognition after collaborating with us. Our client base is diverse, and we know that there are simply too many moving parts in an organization to prescribe a commodity-based, off the shelf approach to improving grassroots advocacy, PAC and government relations performance. We believe in client collaboration as we jointly diagnose and then prescribe appropriate interventions, which vary from training delivery options, to internal and external influence research, to new implementation strategies, to staff coaching. We always strive for a transfer of skills to the client. 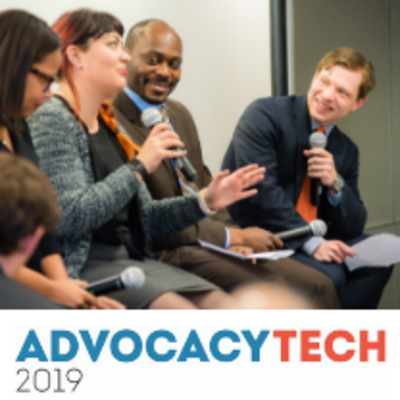 Our approaches revolve around establishing sustainable PAC, grassroots, and lobbying influence improvements that serve the organization for the long-term, rather than ad hoc grassroots, PAC and lobbying campaigns. Our client results indicate that improved performance comes from investment in the application of scientific influence principles, standardized administration and management procedures, organizational support structures, and motivated staff and advocates. Our clients include major corporations such as Southwest Airlines, International Paper and Monsanto, and national trade associations such as the National Restaurant Association and the American Bankers Association. Major non-profits that we have collaborated with include the American Heart Association’s Office of Public Advocacy, Nationwide Children’s Hospital, and the United States Green Building Council. State trade associations that have hired The Showalter Group for consulting projects include the Pennsylvania School Boards Association, the California Healthcare Association, the Ohio State Chiropractic Association, the Ohio Inter-University Council, and numerous state REALTOR® associations.